I cannot believe I have not posted on here in over a year! I'm not sure if anyone still stumbles across this blog from time to time, but just in case, I am going to keep it "alive". Recently, I was watching Life Today (amazing ministry with an amazing TV show that helps care for people physically, emotionally and spiritually) on Roku. I came across an episode featuring Megan Boudreaux. Her episode obviously caught my attention because it had to do with Haiti. Her short interview on the show does not do the story justice! 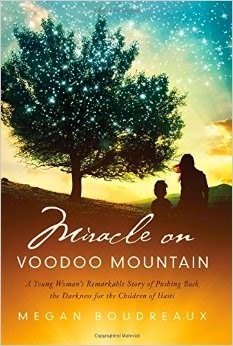 I am so glad I ordered her book, "Miracle on Voodoo Mountain: A Young Woman's Remarkable Story of Pushing Back the Darkness for the Children of Haiti." This young woman had only visited Haiti briefly on two occasions for her job when she kept dreaming about a tree she had seen there. 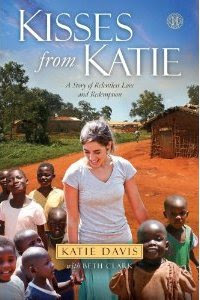 She felt God was calling her to Haiti so she sold everything and went there with no definitive plan. Within a year a school was built, children were being fed, corrupt orphanages were being closed and light was brightly shining on a very dark mountain! I don't want to tell too many details, but if you love God stories, this book is a must read! It is so encouraging to hear of those answering the call and being Jesus in this dark world! A 3rd grader named Ava came up with the idea to have a lemonade stand to raise money for an orphan transition home called Hannah's Hope in Ethiopia. She is asking others to participate and help the cause by having their own lemonade stands on Saturday, May 17, 2014: Lemonade for the Least of These. What a great idea?!? So spread the word to help this precious little girl raise more money for orphans in Ethiopia! Click HERE for more information about the cause. Stuck is now available to watch instantly on Netflix. You can watch the trailer in the post below. Be sure to check it out if you have Netflix and care about the worldwide orphan crisis and international adoption. For more information, click here. Check out the moving trailer below about the new documentary Stuck. Also, go to Both Ends Burning to learn more about this grassroots movement and the ways those involved will be bringing more attention to the plight of orphans around the world in the next few months. Let that sink in. Let all of us who proclaim Jesus as LORD meditate and pray asking Him what more we can do. Go On A Short-Term Missions Trip! In keeping this blog "alive," I'd like to take the opportunity to encourage others to take a short-term missions trip. It is such an amazing, life-changing experience and if you are able, you should go! If finances are an issue, do some fundraising at your church or in your community. Tell your family to forget Christmas/birthday presents and instead make a donation to your trip. There are several other ministries that also coordinate short-term missions trips to various countries around the world. Just type in "short term missions" on Google and see what you find! As I already mentioned in this blog, the children I was blessed to meet at Gift of God Orphanage (GOG) in Haiti are not up for adoption. The focus at GOG is providing great orphan care as those children are raised up to someday help their country. However, there are plenty of other children in Haiti and around the world who are available for adoption. I think this is a good time for that reminder being that November is National Adoption Month. The short video below also goes along with adoption. It was made by a young woman who was on the All God's Children International team that ministered at GOG in August. I would like to dedicate this post to Kristin being that [LORD allowing] she will move to Haiti in March to serve as Director of Adoption Services and Missions at Hope Village, the orphanage currently being built by Global Orphan Hope. Kristin will play a part in helping Haitian orphans in being adopted so in supporting her through prayer and/or financially, YOU are playing a part in adoption as well! Watch below to hear this awesome "God story" and click here to check out Kristin's blog. Orphan Sunday is a day designated to raise awareness of the global orphan crisis. What can you do? If you would like to make a donation, but do not have the money, there are ways to be creative. One thing we did a couple weeks ago was had a garage/bake sale and the proceeds were donated to Gift of God Orphanage. A friend of mine who brought some of her things to be sold offered to give her profit from Saturday to the orphanage as well. How sweet?!? Another idea would be looking into couponing. There are a ton of websites that educate on how to save money through couponing. Maybe whatever you save could be donated to orphan care. Every little bit helps! Our team's mission did not end when we left Haiti. As Dan of Faith Missions International (FMI) told us, we are now responsible for what we know based on what we saw. That being said, part of my job is to let others know what is going on there and pray that God will provide the volunteers and finances to support all that He is doing in Haiti through these ministries. Many of the children at Gift of God Orphanage (GOG) are still in need of sponsors. If you would like more information on child sponsorships, click here. Also, Global Orphan Hope (GOH) needs support in getting the new orphanage, Hope Village, up and running. The greatest need at this point is for volunteers to join the December and January mission teams slated to continue construction on the Hope Village home. As construction progresses with Hope Village, there will be more needs, such as cribs, bedding, etc. Click here to read an article about GOH that recently appeared in a Lincoln, NE newspaper. Below is a picture of the lot where Hope Village is currently being built. Any funds raised over the $4,500 needed to cover the five projects listed above will be used to purchase rice and beans for the children at GOG as well as any future needs at Hope Village. Short-term missions trips are also vital in blessing the orphans in Haiti. If you have never taken a trip, I highly recommend you consider doing it at least once in your life. Five-day trips to Haiti are available through FMI and AGCI. AGCI also offers trips to Africa, China and Bulgaria. If you would like more information on any of these ministries, click on their links to the right under "Help Support Orphans." You can also go to AGCI's website to learn more about adoptions and orphan care around the world. And don't forget to pray, pray, pray for the orphans in Haiti as well as the estimated 163 million orphans throughout the world!!! This was taken at Gift of God Orphanage our last day there. It is our entire team along with most of the children, Smith - the orphanage director (left) and Jonas - one of the men who works at GOG (right). Israel, 14, and me on our last day at the orphanage. He was the first friend I met officially when we got off the truck our first day. I also bought his pottery. Jabeze and Dieumercy hold up some gifts Dieumercy gave me. Teddy, Israel and Jabeze also gave me something before I left! So sweet! Here are all the children singing, "Lord I Lift Your Name On High" in English and Haitian Creole. Church with them was so wonderful! All the children were involved and sang up front at some point. I love the song below and wish I had recorded more of it during church Sunday. Teddy sings the solos. Each of these young men is so precious! I am a working homeschooling mom to five children. I first became burdened for Haiti back in 2007 and now that I have visited the beautiful country and met some of its beautiful people, part of my heart will always be there.